Vientiane, Laos, on the banks of the sleepy Mekong river, is a city in the midst, a confluence of traditional Buddhist culture, bureaucratic communism and an emerging consumer marketplace of goods and ideas. Some young men spend a year or so in a monastery after high school, and then continue their education or go into business. Others readily accept contemporary Western accoutrements and are drawn to the flash of modern life. 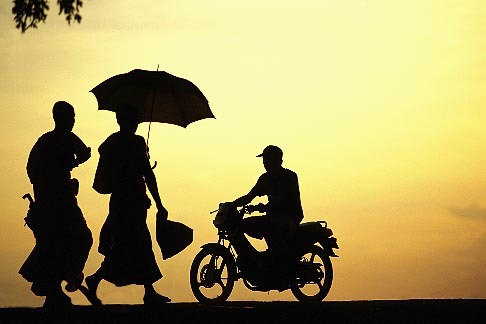 This image, shot late in the afternoon on the riverside levee, highlights the juxtaposition of old and new, with a warm yellow glow contrasting the silhouetted figures, the parasol and the motorbike.